A keloid is an abnormal proliferation of scar tissue which forms at the site of injury, rises above the skin level, projects beyond original wound margins, and does not regress. Keloid formation affects both men and women equally, with the highest incidence occurring between the ages of 20 and 30. In this article, we shall look at the pathophysiology, clinical features and management of keloid scarring. In normal wound healing, there is a balance between new tissue biosynthesis and tissue degradation. This is achieved through the processes of apoptosis and remodelling of the extracellular matrix (ECM). During keloid formation, there is a prolonged inflammatory phase (due to immune cell infiltration into the scar tissue). This contributes to excess fibroblast activity and increased deposition of ECM, resulting in the tissue projecting beyond the original wound margin. Aside from their characteristic visual appearance, keloids fortunately do not normally cause many other symptoms. A small proportion of patients may experience pain, itching, or burning in the scar tissue. Keloid scars are raised above the skin around them and can take on the appearance of a dome-shape, extending beyond the original wound margin. They are often shiny and hairless, with varying consistency. Early lesions are often erythematous, before becoming brownish and red, eventually turning pale as they age. The Vancouver Scar Scale can be used to quantify features of any scar, including keloids. It is particularly useful in monitoring the effectiveness of treatment. It was initially designed for the assessment of burns, but has been found to be clinically useful in evaluating a wide range of scar types. The main differential diagnosis for a keloid scar is hypertrophic scarring, hyperprolific areas of scar tissue that keep within the confines of the wound margin (the main clinical features of each are compared in Table 1). Other (rarer) diagnoses to consider are dermatofibroma or dermatofibrosarcoma protuberans. Table 1 – Comparison of hypertrophic and keloid scars. Diagnosis is usually made on clinical findings, as described above. Biopsy of a lesion is rarely required. A variety of management options are available for keloids. Surgical excision of keloids is rarely performed. It has poor results, with recurrence rates between 40-100%. Surgical excision is thought to stimulate collagen synthesis – which results in the regrowth of a larger keloid. Of the following, which is the greatest risk factor for keloid formation? What is the main differential diagnosis for a suspected keloid scar? Which of the following is NOT part of the Vancouver Scar Scale? Why are keloids rarely managed surgically? 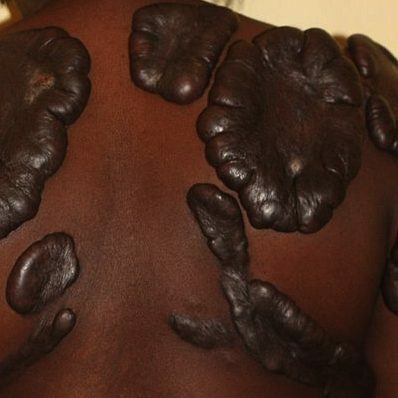 Which investigation is required in the diagnosis of keloid scarring?